﻿﻿﻿﻿﻿﻿﻿﻿﻿Remembering the halcyon days of East Texas squirrel hunting. ﻿﻿﻿﻿﻿﻿﻿﻿﻿﻿As Paw steered the truck off the blacktop and onto the red dirt road leading into the woods, Blackie signaled our arrival with a series of long, deep howls. Paw glanced toward the black-and-tan hound perched in the pickup and smiled. Blackie liked putting the squirrels on notice, giving them a bit of a head start. Black-and-tans have a reputation in old hunting dog circles for their aptitude at chasing big game, like deer, but in East Texas during the late 1950s and ’60s, there were no deer. Regardless, I doubt that Paw would have sent his prized squirrel dog after one for fear it might have ruined him. Blackie had a reputation in Cherokee County as a top-notch squirrel dog and was the subject of many hunting tales in squirrel camp. ﻿﻿﻿﻿The numbers of squirrel hunters and squirrels, such as the eastern gray squirrel, have been on the decline. Yes, squirrel camp, where families and friends celebrated the annual season opener on Oct. 1. No work, no school. It was a festival of sorts, where Paw swapped stories with the other elders as they played dominoes, and the kids explored the creek bottoms for arrowheads and fished for perch. Mostly, we hunted squirrels. It wasn’t that long ago that squirrel ranked as the most popular hunting pursuit in East Texas, mainly because that was the most abundant wildlife species, but also because that’s what East Texans always hunted. There were cat squirrels in the bottoms and big, fat fox squirrels up in the hills. Squirrel was a food source and a part of the cultural heritage dating back to the early settlers, who brought squirrel hunting with them from southeastern states. It wasn’t uncommon at squirrel camp to see a No. 2 washtub filled with bushy-tails; I learned to skin a squirrel before I could tie my shoelaces. Some things you never forget, like the taste of fresh squirrel, cooked only the way Ma could. Table fare represents only the bounty of the hunt. As good as it is, it cannot compare with the actual hunting experience. East Texas dirt has a distinctive smell, especially in the fall when the leaves blanket the ground, covered in morning dew. It’s a magnificent odor, a clean, earthy scent with a hint of sweetgum and oak. You learn to appreciate the smell of the woods when you’re hunting squirrel, even when trying to keep up with an exuberant hound. Blackie was what you would call a free spirit, and he liked to range, which meant he had no qualms about treeing a squirrel a half-mile away and baying nonstop until you got there. 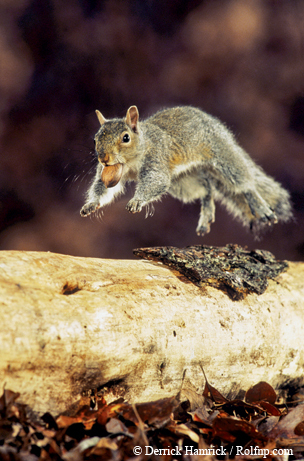 ﻿﻿﻿﻿Squirrel hunting has long been an East Texas tradition. Paw was seldom in a hurry. He would stop to inspect things, usually under a big oak tree, and explain stuff in hushed tones, like what weeds were good for this or that and which ones to avoid. I figured he was whispering so we could hear Blackie. Invariably, we’d claim a squirrel or two on the way to where Blackie had treed his prey. I would figure out later in life that we were actually hunting squirrels all the while using a technique called “still hunting.” To me, it was just walking with my Paw learning about the woods. We hunted with .22s — bolt action, single-shot rifles. I got to carry the .22, but Paw kept the bullets in his pocket and would hand me one when the time came. It was a lesson in firearm safety and hunting ethics. It required patience and accuracy. It was an excellent way for a kid to learn how to hunt and still is today, although the opportunities may be tougher to come by. Times have changed. Texas Parks and Wildlife Depart­ment biologists conduct annual wildlife census surveys on many game and non­game animals, but have not tracked squirrel populations since the 1970s. A decade ago, squirrel hunting was removed from TPWD’s annual Small Game Harvest survey, presumably because of trending declines in participation. According to the last survey in 2003, there were only 71,000 squirrel hunters in Texas, down from 231,000 just 20 years earlier. Though numbers declined, the success rate for squirrel hunting remained practically unchanged. Those who participated were still just as capable of bringing home a “mess” of squirrels. What did change was the number of squirrels harvested, which dropped from 1 million to 287,000 during that 20-year span. Supply, or lack of, was driving demand, and the cause was shrinking habitat. The seeds of change were sown during the devastating drought of the 1950s. Intensive dam-building efforts that started in the 1930s resulted in the creation of more than 100 reservoirs across Texas, but it wasn’t enough. Determined to stockpile water to meet the economic needs of Texans moving forward, the Texas Water Development Board in a 1963 report outlined what it ironically deemed “conservation storage.” In the years since, more than two-thirds of Texas’ major reservoirs have been constructed, flooding hundreds of thousands of acres of hardwood bottoms. Demand for forest products, including the use of hardwood to manufacture fax paper in the ’80s and ’90s, further depleted the East Texas landscape of suitable squirrel habitat. As prices climbed, even small pockets of oaks were being sold off to the chipper mills. Land that had been open to squirrel hunting was being clear-cut and converted to improved pasture or pine. Some folks blame the white-tailed deer for the demise of the squirrel hunting tradition in East Texas. It was not that long ago that deer were not a part of the Pineywoods landscape, having been extirpated in the early 1900s. Changing land-use practices that started in the 1960s opened the way for deer restoration efforts. Before long, the whitetail had returned to East Texas, and their numbers climbed, as did interest in the hunting community. Land previously used primarily for squirrel hunting was being leased for deer. There were just fewer and fewer places to hunt squirrels. 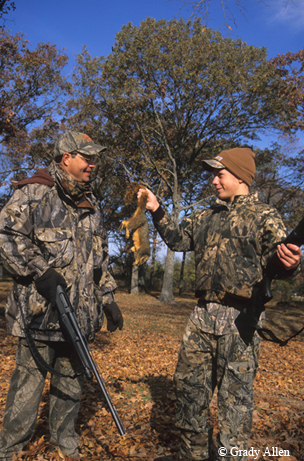 There are still places where a squirrel hunter can bag a few bushy-tails and pass down the lessons the woods can teach to a youngster. But the big woods where squirrel hunters once gathered in camps are gone and with them a big piece of hunting culture in Texas.